In 1803, President Thomas Jefferson “purchased” 828,000 square miles of Louisiana territory from France. Since little was known about the West, a group of U.S. Army volunteers under the command of Captain Meriwether Lewis and Second Lieutenant William Clark was chosen to explore and map the newly acquired land so that America could claim the the western land before European countries could. When Lewis and Clark returned three years later, they brought home news of the Pacific Ocean, the Rocky Mountains, multiple Native American villages, and descriptions of new plants and animals. They also brought home the story of Sacagawea, the Native American who helped lead them on their journey. Sacagawea was born in 1790 to a Shoshone chief, but was kidnapped by the rival tribe Hidatsa when she was ten years old. Three years later, she and another Shoshone girl were purchased by Toussaint Charbonneau, a French Canadian trapper. Sacagawea was 16 and pregnant when she met Lewis and Clark. Lewis and Clark were in South Dakota in 1804 asking fur traders to be interpreters. Though Charbonneau knew several Native American languages, Lewis and Clark were impressed with Sacagawea because she knew Shoshone. The travelers needed horses to travel across the Rocky Mountains, but since they were traveling by boats at first, they could not bring the horses with them. They knew the Shoshone tribe used horses so they planned to ask the Shoshone tribe to use the horses. Thus, Sacagawea and her husband were chosen. On February 11, 1805, Sacagawea gave birth a bay name Jean Baptiste, nicknamed Pompey by the travelers. For the rest of the journey, Sacagawea carried Pompey on her back. Within a month of traveling, the small boat Charbonneau was navigated capsized. While Charbonneau panicked, Sacagawea gathered important papers, books, and medicines was making sure her baby was safe. In her honor, the river was named after her. When the group made contact with the Shoshone, Sacagawea served as the interpreter. To her surprise, the chief was her older brother. The siblings were reunited and celebrated their reunion. Though Sacagawea could have stayed with her family, she continued with Lewis and Clark. Throughout the trip she was able to identify plants that were either medicinal or poisonous and she helped guide the travelers, leading them through a mountain pass in Montana. Sacagawea’s biggest contribution was the fact that she was female. The American travelers would have alarmed many tribes, but seeing a woman with a baby meant the Americans meant no harm. After seeing the Pacific Ocean, the group returned home. Sacagawea and her husband parted with Lewis and Clark at the Hidatsa village in Missouri on August 14, 1806. Three years later, they visited Clark in St. Louis. Clark made a deal with them; he would provide the family with farming land if he could educate Pompey. Farming didn’t work out for the family, but the parents left Pompey in Clark’s care. In 1812, at the age of 22, Sacagawea died from poor health. Sacagawea walked hundreds of miles with her baby on her back, climbing mountains, riding horse back, sailing down rivers, and camping out during blizzards. Sacagawea also made the difficult decision to have Clark raise her child because she knew her son would receive the best education and life with Clark and not her and her husband. Because of her, Lewis and Clark were able to finish their journey, coming in contact with 72 tribes and mapping out the trail to the Pacific Ocean. If Sacagawea was not there, the travelers may have been viewed as a threat and killed, alternating history. 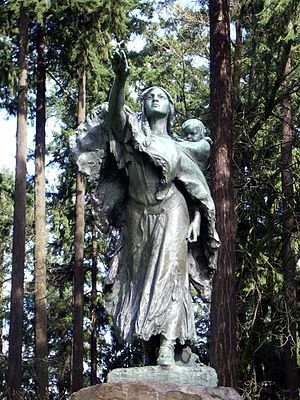 Though Sacagawea had a short and difficult life, her contributions to the United States are the reasons why she has more statues and monuments than any other female American in the United States. Really good post. I definitely wouldn’t have learnt this anywhere else. That comment made my day. I feel as though history classes never spend time on women. Glad to have helped! You’re welcome. I remember only learning about 2 women as a kid at school even though we all vaguely knew of many others who were important historical figures.